Is it worth buying an energy efficient air conditioner? They say that if you can’t handle the heat, you should get out of the kitchen, but during an Aussie summer it seems everywhere you go is the kitchen. Some discomfort is inevitable in the summer months Down Under. 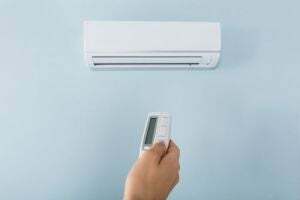 The warmer months see a scurry of people rushing out to buy an air conditioner – just any old one – without much thinking about its energy-efficiency, or whether it’s actually any good. They just want something to blow cold air in their face. That’s fine for a lot of people, but others will want to get the one that’ll cause the least damage to their electricity bill and their back pocket. Is an energy-efficient air conditioner worth it, or is it all just a load of hot air? We review the upfront costs of buying an energy efficient air conditioner and what it means for your ongoing electricity costs. What are the most energy efficient air conditioners? For other air conditioner types, it’s a mixed bag – Kelvinator seems to fare best for window air conditioners, for example. Let’s dive in and see just how efficient different types of air conditioners can get. Split system air conditioners are generally the most energy-efficient type of air con you can buy. They are also a favourite among Aussie households, usually for their quiet operation and effective cooling, along with minimally-invasive installation and aesthetic units. The Panasonic unit also has comfort features, such as a built-in antibacterial filter and dehumidifier, a removable washable panel, a soft-dry operation mode, and an odour removing function. Its indoor sound level is stated to be 47 decibels, and its outdoor sound is 62 decibels. In both instances, it operates slightly louder than a whisper. It packs in 4.2kW of power. For about $1,600, it’s a fairly pricy unit for its size, but its efficiency features make up for it. Overall it rates five stars for cooling energy efficiency and 5.5 stars for heating energy efficiency. The old ‘window rattlers’ have come a long way, so they won’t exactly rattle your windows anymore. While generally less efficient than a split system air conditioner, window units do have some merit when it comes to energy-efficiency. Plus, people like them because they are easy to install and are great ‘bang for buck’. This Kelvinator air conditioner is an interesting model as it not only packs in 5.3kW of power, but also rates at 2 stars for energy-efficiency. We know you’re probably laughing at this, but a 2 star rating is actually pretty decent for window air conditioners. 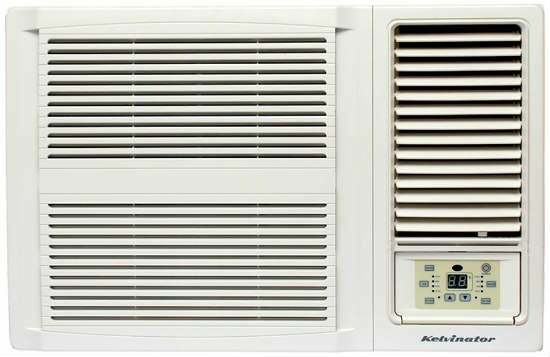 It’s fairly feature-packed for a window unit, with anti-bacterial mesh, a 24-hour timer and an auto restart function, as well as manual operation. It also commits 1.7L of moisture removal per hour. Window air conditioners are generally not as quiet as split systems, but the Kelvinator doesn’t fare too badly. It comes in with a 52 decibel indoor sound level, which is quieter than a regular conversation, and is one quarter as loud as 70 decibels, which is when noise can become quite annoying. For what is a feature-packed, reasonably energy-efficient air conditioner, you can expect to pay $1,349 (RRP), which is high considering other window units can be found for $400. You’re paying for its power and relative efficiency though. Window air conditioners are great for easy, fuss-free installation but they generally leave a little to be desired compared to split system units. Daikin is dominating in this area with its 7-star ‘Super Efficient’ air conditioner. The Daikin US7 split system air conditioner is boasted to provide premium air quality with humidifying, dehumidifying, ventilating and air purification capabilities that are approved by the National Asthma Council of Australia. It features R32 refrigerant, stated to enable increased energy-efficiency, plus a reduction in ‘Global Warming Potential Factor’. Other features include Coanda Airflow and 2-Area ‘Intelligent Eye’. Its Coanda Airflow is designed to stream air along the ceiling for “longer” throws and deliver efficient cooling and even distribution, according to Daikin, while its 2-Area ‘Intelligent Eye’ means cool air is either blown towards you in the room or away if you prefer draft-free comfort. Is it worth buying an energy-efficient air conditioner? There are a lot of questions you’ll need to ask yourself when considering whether or not to buy an energy-efficient air conditioner. Chief among them will be: How fast can I recoup the cost spent on an energy-efficient model by saving money on electricity? The answer varies, but most people recoup the costs so slowly that it’s barely noticeable. Still, it’s a saving, and a penny saved is a penny earned. Do you spend more initially on an air conditioner with a high energy-efficiency rating, and reap the rewards later in the form of smaller electricity bills? Or do you spend less upfront on a cheap air conditioner, and deal with the larger power bills when they come? Many people will choose the latter because they don’t want to take that big hit to their bank balance, or perhaps they just can’t visualise the long term benefits of owning an air conditioner that’s cheaper to run. Many people might see it as pointless buying X air conditioner for $1,500, when Y air conditioner does all the same things but costs half the amount. For savings to be had, you need to look at the long term picture. So, we decided to crunch the numbers on two air conditioners to see whether or not it really does pay to be energy-efficient. The models are fairly small units in the scheme of things – designed to work in a small-medium sized room about 20m². The results are based on air conditioner use of three hours per day over the three hottest months of the year – December, January, February. Remember that if you plan on using your air conditioner for more than three months a year, and more than three hours per day, your annual running costs will be higher than those reported in this article. As you can see, there is a considerable discrepancy between the efficiencies of example X and Y. 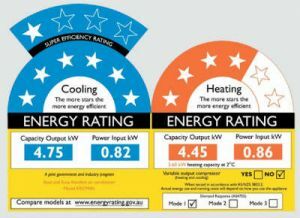 While the energy-efficiency ratings labels are a handy way to compare appliance energy consumption, air conditioner efficiency is measured in EER. As mentioned previously, this is a ratio of how well an air conditioner cools verse how much energy it needs. The higher the energy efficiency ratio, the more efficient the air conditioner. As you can see, example Y has an EER of 3.28 compared to example X’s 4.07. This difference means example Y costs nearly twice as much as example X in power costs over 10 years. How important is that extra money to you now, if you can’t get proper enjoyment out of your air conditioning unit. Are you happy knowing you will pay hundreds of dollars more in the long run if it means you get a good deal in the here and now? Something that’s also worth considering is the environmental impact of running a less energy-efficient appliance. Sure, you get to keep an extra couple of hundred dollars in your hip pocket when you buy your air con unit, but what price do you put on all those warm, fuzzy environmentally-feelings? Think of the dolphins! Overall there are a lot of factors at play when it comes to deciding what air conditioner to buy. The safest piece of advice is to consider your budget and go from there. Stay cool this summer and have a happy air conditioning hunt!